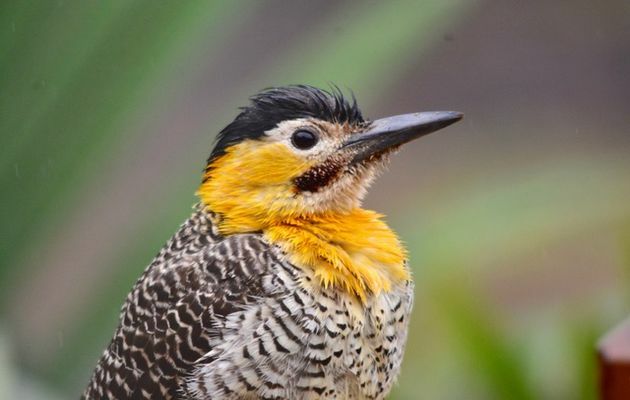 The field flicker woodpecker (Colapsis campestris) (also known as Ypekú Nú), is a bird which measures about 32 cm and lives in the tropical and semitropical savannas in the centre of South America. I took some instant photos of this beautiful bird during a recent visit to this continent. Every type of woodpecker possesses a range of defence mechanisms against cerebral lesions. While pecking a tree the woodpecker is subjected to impacts of up to 1400 times the force of gravity. However, we human beings can only withstand impacts of up to 8 times the force of gravity before becoming unconscious. How do they manage to protect their brains while hitting their beaks against a tree thousands of times in search of food? Why do none of them ever die of concussion? These birds present numerous anatomical, physiological and biochemical adaptations against these repeated impacts. For example, they have skulls with spongy layers; powerful neck-muscles; thick internal eye lids which close upon each impact; bony eye-guards for each eye; sharp beaks the upper and lower parts of which can move independently; a long tongue that surrounds their skull and can reach deep into the hole they have made; they also have a special tau protein covering and protecting their brain cells. Each of these adaptations possessed by the woodpecker poses a challenge for the Darwinian model, but together they represent an insurmountable problem. How many pre-woodpeckers had to die of concussion before the first one managed to drill a hole in the wood to find an insect as a result of its efforts? All the pieces of this complex jigsaw had to be in place at the same time before any of them could work effectively. What would be the point of a powerful beak that could drill a deep hole in the trunk without a tongue long enough to protect its brain. And even supposing that it had a beak and a long tongue, what use would they be without the tau protein that protects its brain cells? Everything had to be in place and operative from the very start. The woodpecker’s skull has in fact served as a model for engineers in the design of special helmets for American football players. Nevertheless, many people still believe that the forces of nature alone built, purely by a series of accidents, all these wonderful structures. Is it reasonable to think like this? Is it not more logical to believe that a design of such complexity requires a Designer?